This list is a compilation from several sources, and no claims are made as to its accuracy. A few famous people who have been rumored to be Freemasons but for which no evidence can be found include presidents George Herbert Walker Bush, Bill Clinton, Thomas Jefferson, Abraham Lincoln, Ronald Reagan and Lyndon Johnson, along with Thomas Paine, Neil Armstrong, Walt Disney, Charlie Chaplin, Bob Hope, Ringo Starr, Rev. Billy Graham, and Charles Taze Russell, the founder of Jehovah's Witnesses. George H.W. Bush was sworn in as president on George Washington's Bible, which belongs to the St. John's Lodge of New York City. Clinton was a member of the Order of DeMolay as a teen, but never joined a masonic lodge. 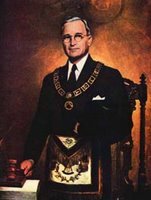 LBJ took his first degree in 1937, but never became a Fellowcraft or Master Mason apparently due to lack of time to pursue both his Congressional duties and his Masonic studies. Lincoln petitioned a lodge but withdrew his petition before being accepted, apparently to keep from appearing to be wanting to join for political reasons. In 1988, Reagan was given a Certificate of Honor from the Grand Lodge of Washington, D.C., and made an honorary member of the Scottish Rite and of the Imperial Shrine, but was never a Mason. See MasonicInfo.com for more information about famous Masons and non-Masons. As I'm pasting into the blog this list I compiled several years ago, I'm struck by the fact that there are so few — two, actually (the actor Michael Richards and football star John Elway) — men on this list from my generation, or from "modern times." Are there are any "famous" Freemasons anymore, men known for high achievement in their chosen fields who are also Masons? — U.S. vice president. Presidential candidate who lost to Abraham Lincoln. — President of the U.S.
— Mayor of New York City, Governor of New York, and presidential candidate, he also served as Grand Master of the Grand Lodge of New York. — Third vice president of the United States. — American frontiersman and Congressman. Remember the Alamo! — Founder of "Bob Evans" restaurants. — Inventor, ambassador, newspaperman, and signer of Constitution of the U.S.
— Built the "Gatling Gun"
— Author of "Decline and Fall of the Roman Empire"
— Was the libretist for "Pirates of Penzance"
— Creator of "Little Orphan Annie"
— Inventor of the "Guillotine"
— Composer "Father of the Blues"
— American colonial patriot, member of the Continental Congress, he spurred the creation of the Virginia militia with the famous words "Give me liberty or give me death." Later served as the Governor of Virginia. — Vice president of the U.S.
— Famous for "Taxation without Representation is Tyranny"
— Coined the term "Athlete's Foot"
— Founder of "Guidepost" magazine; author "The Power of Positive Thinking"
— Pioneer, explorer, Confederate General, he re-wrote the rituals of the US Southern Masonic jurisdiction of the Scottish Rite Bodies, as well as the Masonic treatise "Morals and Dogma." — Discovered the great peak that bears his name. He was killed in action at Toronto during the War of 1812. — Built first sleeping car for trains. — American silversmith, engraver and Revolutionary hero who on April 18, 1775 made his famous ride to warn "The British are coming!" as celebrated in a poem by Longfellow. Revere was a Grand Master of the Grand Lodge of Massachusetts. — Great American Army Air Corps "Ace"
— All seven brothers and their father were Masons. — U.S. Senator who cast the one impartial vote of "Not Guilty" thus saving President (and Brother) Andrew Johnson from impeachment. — U.S. Senator from Georgia and member of the "Warren Commission" that investigated the assassination of President Kennedy. — Founder of "The Builder"
— Founder of Wendy's restaurants. The hamburgers at Wendy's are square as a reminder of Dave's motto: "Never cut corners." — Revolutionary War General, "Martyr of Bunker Hill"
— First president of U.S.
— Director of "Ben Hur"
— Former mayor of Atlanta, Ga.